Latimer died on 2nd March 1543 at the Latimers’ Charterhouse home. It is not clear whether Katherine was with him throughout his illness, or whether she had begun to spend time at Court with the Lady Mary (as Henry’s elder daughter was now known, having been demoted from the rank of Princess). Originally labelled as a portrait of Lady Jane Grey, this has been proven by Dr Susan James to be of Katherine Parr. Katherine’s biographers differ as to whether Katherine was actually a paid, permanent member of the Princess’s Privy Chamber, an “extraordinary” member who attended the Princess from time to time, but did not need to be paid, or just a guest. There are certainly no records of payment of any salary to her, and Porter contends that this means she could not have been an official Lady in Waiting. James, on the other hand, cites a note in Henry’s accounts, for clothes and material for Mary, with Katherine’s request that the Henry’s accounts department pay the bill as evidence that she was employed by the Princess. Whatever her position, Katherine was in a position to catch the eye of new suitors and she soon had two men courting her. Katherine was very much taken, as was proven in later life, with the charms of the dashing Sir Thomas Seymour, brother of the late Queen Jane Seymour. Seymour was described as handsome with a magnificent voice, but “somewhat empty of matter”. The contrast with the old-fashioned Latimer, twenty years her senior and a nervous wreck following the Pilgrimage of Grace, could hardly have been greater. However, Katherine was unable to accept Seymour’s proposals, as the eye of the King had fallen upon her. Before long, he was sending gifts and visiting her daily. By summer 1543 her fate was sealed and she married Henry as his sixth wife. It is impossible to accurately gauge Katherine’s emotions – she must have been terrified, remembering the recent fates of Anne Boleyn and Katheryn Howard, yet the opportunity to be Queen, to raise her family to undreamed of heights, and perhaps to lead Henry towards further reform of the Church, cannot have failed to allure. In any event, she had little choice. Even if her family did not press her into such an advantageous match, Henry would not take no for an answer. 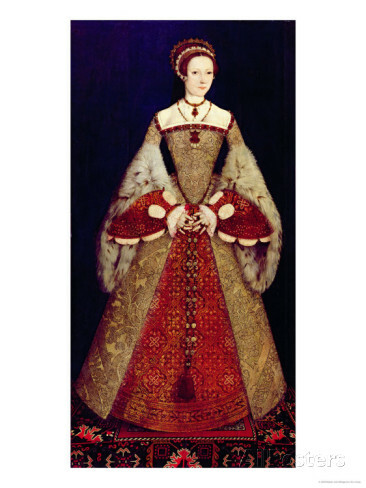 On 12th July 1543 Katherine was married in the Queen’s Closet at Hampton Court, and became Queen of England. At her marriage, she was attended by her sister, Anne, Lady Herbert, her step-daughter Margaret Neville and her two new step-daughters, the Ladies Mary and Elizabeth, as well as Lady Margaret Douglas, Henry’s niece and a great favourite at court.